McGuiness Dermatology always appreciates feedback from our valued patients. To date, we’re thrilled to have collected 514 reviews with an average rating of 4.83 out of 5 stars. 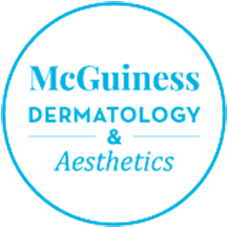 Please read what others are saying about McGuiness Dermatology below, and as always, we would love to collect your feedback. Fit me in last minute, addressed my issue quickly, very accessible. Dr Hodges is a very pleasant and professional person. My visit last week was my third appointment with Dr. Hodges. At each appointment, Dr. Hodges listened to my concerns and responded with professionalism and courtesy. After our conversations, Dr. Hodges performed the necessary procedures to resolved my medical issues. I look forward to seeing Dr. Hodges again next year for my annual skin inspection. Also, I would recommend her to my friends and family. Any Jones has done an amazing job for me. I moved to Celina area from Oklahoma and was having issues with my skin. She has done so much more for me than my dermatologist in Oklahoma. I would recommend her to anyone having skin problems. She is very professional and personable. Explains things in detail and doesn’t hesitate to answer your questions. Amy is first class and I will continue to Seeger for my needs. I give her an A+ rating. Friendly staff, courteous, makes one feel comfortable during exam. Dr. Snipes was so helpful and kind. I had a great experience with her! I felt like she genuinely heard my concerns and wanted to help find a solution for them. All things seem successful. Like Amanda whole lots. thank you. Ms. Snipes and her assistants are always efficient and thorough. She respects the modesty of the patient while being very conversational and interested in the patient. She also respects the fact that some of the simple in-office treatments may be uncomfortable for patients; being sensitive to asking permission to treat and giving the patient permission to express any discomfort so as to conduct treatment at a pace that minimizes discomfort. Very much a professional practitioner which encourages periodic preventative examinations. Great Professionalism and very careing, it’s a Blessing for want you Folks do for all the people that needs careing. Thank you and Have a Blessed Day!!!! Very professional, while still being personable. Jennifer and the staff have been wonderful each visit I’ve had at Dr. McGuiness’s office.